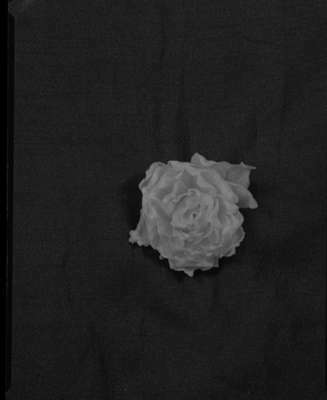 Black and white photograph of a flower. This photograph is found with the portrait of Arthur Lynde (1887-1952) whose hobby was the growing of delphinium. He was a recognized authority on that variety and often was a judge at flower shows. Lynde was also a gifted musician and supervisor of music in Whitby public schools for a number of years and was choir leader of both the Presbyterian and United Church choirs at various times. The flower in this photograph looks like it may be a rose. Flower, 1946, Marjorie Ruddy. Whitby Archives A2013_040_1270.